Once again on Feb. 4 Russians protested in New York against vote fraud during the Dec. 4 parliamentary elections, but this time, the rally launched a new organization – the Coalition of Russian-speaking Organizations for Civil Rights. In New York on Feb. 4, another public protest in solidarity with Russia brought together about 200 people and eight non-profits that work with Russians citizens living in the United States and Russian-speaking Americans. Two weeks ago, eight people met in the city to form the Coalition of Russian-Speaking Organizations for Civil Rights. Seven of the representatives became full members of the new organization, and one has observer status. The group aims to improve relations within the Russian community, liaise between Russian-speakers and other ethnic communities and, in particular, lobby for simplifying the process of obtaining Russian citizenship for those who have lost it. One of the members of the coalition is the Institute of Modern Russia run by Pavel Khodorkovsky, the son of Mikhail Khodorkovsky. The Institute’s main goal is to support democratic values and institutions in Russia. Among other coalition members are the Committee for Democratic Russia, steered by Natalia Pelevine, one of the main activists lobbying for the Magnitsky List; and an independent initiative group Fair Vote for Russia – New York, formed on Facebook in December 2011 by Russians living in New York who wanted to do something to support the actions of their friends and families who were protesting against alleged electoral fraud. 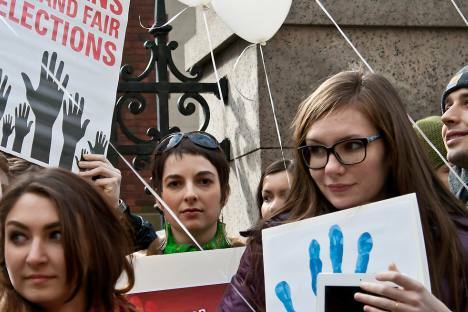 The Fair Vote for Russia protest on Feb. 4 was the first practical act of the new coalition. Unlike similar protests on Dec. 10 and 24, which mainly brought together Web-savvy activist in their 20s and 30s, this meeting was organized by people across a wide spectrum of ages and brought together participants ranging from children to retirees. The other speakers at the rally represented a wide range of ages and viewpoints. Dmitry Glinski, representing the coalition member Russian-speaking Community Council of Manhattan & the Bronx, Inc., said that he came to break the stereotype that Russians don’t care what is happening in their country. Young Russian politician Maria Gaidar, daughter of former Russian Prime Minister Yegor Gaidar, who is currently doing coursework for a Master’s degree at Harvard University, came from Boston to support the protestors in New York. During her time in the U.S. she has begun a semi-informal movement called WakeUpRussia! in an attempt to build on the enthusiasm of the Fair Vote movement. Alexander Bolonkin of the International Association of Former Soviet Political Prisoners and Victims of the Communist Regime (IASPPV) appealed to those who remember the Soviet era and suffered under the regime. In his speech, he emphasized importance of learning the lessons of the past. Pavel Litvinov, a human rights activist with decades of experience from Friends of Memorial, which is also a member of the coalition, couldn’t attend the meeting but expressed his support in advance. Andrew P. Grigorenko from the General Petro Grigorenko Foundation entered the coalition as an independent observer. Russian protest leaders including Ludmila Alekseeva, Olga Romanova and Grigory Yavlinsky sent messages to those protesting in New York. “Our sense of dignity is stolen. Our reputation is stolen. The word ‘shame’ is stolen from us, as well as ‘honor.’ We are for fair elections! We are for our country! We’ll take it back!,” said Olga Romanova in her recorded appeal. Well-known human rights activist and writer Alexander Goldfarb (author of “Sasha, Volodya, Boris… A Murder History”) shared his point of view on the situation. “We are talking not only about fair elections, but mainly about the fact, that, in the opinion of foreigners, Russia’s leaders are merging with criminal gangs,” he said. At the end of the rally, dozens of white balloons, a symbol of fair election took off into the sky.